Sulawesi was my next destination after Borneo, and before Papua.I just spend one week but i could appreciate its great wildlife and amazing birds.Sulawesi is one of the most interesting places where to go.Located on the Wallacea linea area,on the confluence of asian and Oceania species,it hosts many endemic species. I arrived at Manado after a hard trip from Bornean Sabah,crossing the border to Bornean Indonesia by boat and flying by some old but “quite” reliable airplanes.I slept just one night and afterwards i got into a small public bus to and a private van,rented with other backpackers, to reach the Tangkoko National Park,one of the most important national parks in Sulawesi. Once there,i could find acomodation easily,so you have enough offer to choose.Acomodation is simple but confortable and prices are cheap.Afterwards, I went to the headquarters to gather some information about the birds of the park and to ask about the star bird of Sulawesi,the Maleo.On the way i frequently saw Crested Black Macaques. My first day i was atonished by the presence of my first Sulawesi bird,a Green-backed Kingfisher.It s a huge kingfisher with an amazing array of colours,with a mostly orange body,a blue head and a green back.I saw it perched on exposed branches many times on the sides of the main trail.It s a quite common bird inside the park,but however it s a threatened species.Rainbow bee-eaters and Finch-billed Mynas are other birds easily seen around the park.Red-backed Thrush are seen along the trails on the ground or exposed on rocks. Around midday i could spot an amazing Purple-winged roller twice ,in a clearing area close to the beach. 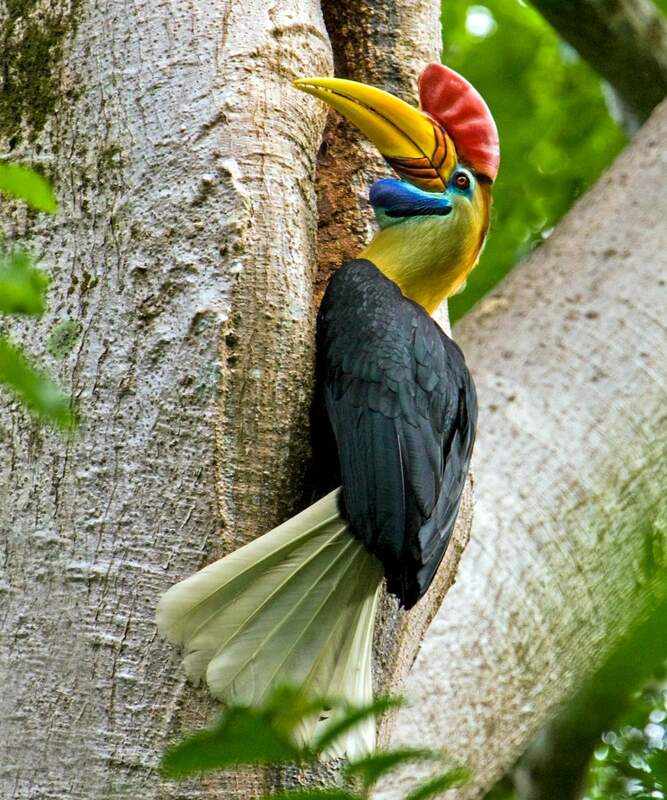 On my second day,I arranged a trip with a guide for a reasonable price along a tricky trail to spot the 2 endemic birds of Sulawesi: Sulawesi Hornbill and Knobbed Hornbill.On the way,Philippine scrubfowls were seen running fast on the ground and at the end of the trail,close to the beach,i could delight my view of both endemic hornbills close to each other.I spot a single Sulawesi Hornbill eating fruits on a tree and pair of Knobbed Hornbills being careless of my presence.I had enough time to take pictures of these incredible hornbills !!! We came back to the headquarters and i went by my own along another trail wishing to find new species.This trail lead me to meet another great endemic kingfisher,the Llac Kingfisher.It was a male perched on a liana, far from the beach. 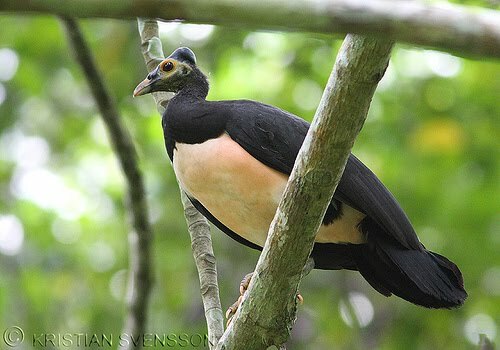 On late afternoon i talked to the guides to arranged a trip to see the main atraction bird in Sulawesi,the very threatened Maleo.I hire 2 guides and a boat to bring me to a Maleo´s nest for next day. 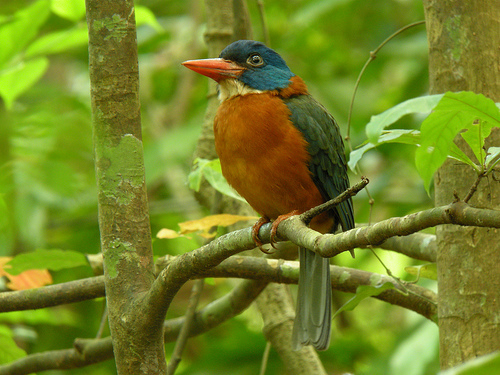 I wake up very excited at 6 o´clock in the morning and i went straight to the headquarters,ready to spot this magnificent and unfortunately near extinction endemic bird.The trail passes through a small stream where i found a gourgeous Ruddy Kingfisher that flew very fast after noticing my presence. Once arrived there we went to the beach to get into the boat.We spent almost one hour on the boat and afterweards we could reach a dry and rocky coast.Climbing on the rocks we follow a tiny trail,full of scrub. After just 3o minutes walking we arrived at the nest area of the Maleo bird.There were many piles of sand spreaded on this area but no presence of these birds.We hide among the scrub and moving quietly acording to the wind blows.This bird is a shy bird and any single sign of us could make them to abandon its nest.We were waiting from 8 o´clock to 10:30 am but the bird didn t appeared.So we gave up and left the place.I was disappointed but in other hand glad to see these bizarre nests that they build where they lay the eggs that are incubated by the heat of the sun and the soil. In spite of this i enjoyed a lot in this national park where I could see many endemic species !!!!!! Maleo is an incredible and endemic bird of Sulawesi, that has a curious behavior.When nesting it makes a pile of sand and lay its eggs on it.The heat of the sun or of the volcanic soil incubate its eggs.Unfortunately it´s a very threatened species, with only 5000-10,000 individuals on the north of the island !!! Check the video until the end !! !